As the Reels Turn 1 is an islot video game with a story that players will have to unravel as they move on to new scenes and Bonus games. 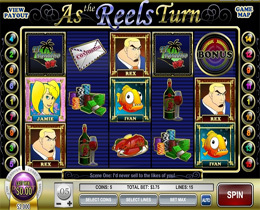 This is a 5 reel, 15 payline saga game that begins in the El Paradiso Hotel and Casino and contains a 1 000 coin Jackpot that players can increase during the Bonus games by up to 3 000 coins. This islot contains interesting features such as attractive Free Spins, exciting Multipliers and interesting Bonus Games which are guaranteed to keep players enthralled and captivated. Players must look out for As the Reels Turn 2 and As the Reels Turn 3 which are sequels in this series. 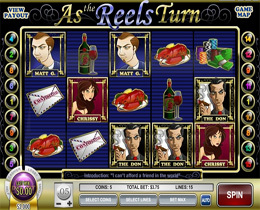 As the Reels Turn 2 is the second part of these islot series and after playing the first one gamblers will know a lot more about islot games and that they are unique story slots. The game starts off with a Don that has his eye on a particular casino and how the Manager of the casino tries to protect it from the evil Don and his shady undertakings. The icons are depicted with character icons such as Danny, Jamie, Ivan, Vanessa, Gambling Chips, A Bottle of Red Wind and a Confidential Letter. The quality sounds definitely enhance the whole gaming experience and together with many Bonus games, there is an exciting Jackpot of 1 000 coins up for grabs too. As the reels turn 3 is an iSlot consisting of 5 reels and 15 paylines with interesting characters such as The Don, Matt G, Danny, Jamie and Vanessa. If you are an avid player and have tried out the previous two games then you will be familiar with the way iSlots work. It is a slot based story in which the player progresses through the levels as the game is played. The El Paradiso Hotel and Casino has become the target of the Don who wants to get his evil claws into it and the Manager who is trying to keep the Don at bay. The charming Mrs Livingstone and Pampers the feline are the two new additions to this slot. When The Pampers icon shows up on the screen during the Free Spins Feature it will expand over the whole reel. A 2x multiplier will be awarded to a player when a Pampers icon appears and a 4x multiplier will be awarded when 2 of them appear. When 3 or more As the Reels Turn 3 icons show up on the screen, the “Scene Advancement” round will be triggered. Every time 3 of these icons show up on the scrren, the story progresses to the next level and The Danny Bonus Feature will be triggered at the same time. The high quality graphics, stunning sound effects and colourful animations definitely add to the exciting vibe around this iSlot. It is advisable for gamblers to play all three versions of this iSlot to get the feel of the whole series.